I’m interested in identity and exploring aspects of personality and how we play parts in the various areas of our lives. All of us have different ways of being depending on the situation we find ourselves in. Who I am at work is not exactly the same as who I am with family, or with various groups of friends. For some people the differences are subtle and more about emphasising certain qualities than about being a completely different person. For others, it’s more a matter of playing a part. In my roleplaying group, I’m interested in how much the characters we create are related to who we really are. 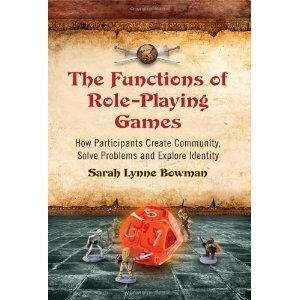 So, The Functions of Role-Playing Games: How Participants Create Community, Solve Problems and Explore Identity by Sarah Lynne Bowman really appealed to me. The book covers the evolution and development of roleplaying, both as a leisure activity and as a training tool in military and corporate environments. It looks at the skills that can be developed and how scenarios can be used as learning tools, and refers to studies that show that learning through simulations or role-playing is more effective than book study and classroom teaching. Bowman also considers the link between play and learning in childhood and the social pressure to move on from these activities in adulthood, and what we may lose from doing so. Bowman considers live-action roleplaying, tabletop roleplaying and computer games with roleplaying elements. She looks at the two dominant systems, Dungeons & Dragons and World of Darkness and uses personal examples to demonstrate her points. Bowman has conducted in-depth interviews with a small number of long-term roleplayers, examining their experiences and the benefits they get from roleplaying. The Doppelganger Self, a character very close to the player’s personality. The Devoid Self, the player but lacking an essential quality that the player possesses in real life. The Augmented Self, the player, but better, with some quality that the player doesn’t possess. The Fragmented Self, a subdued aspect of the player’s personality forming the central concept of the character. The Repressed Self, an outlet for the player’s Inner Child, a naive, innocent version of themselves. The Idealized Self, a character with qualities the player wishes to have. The Oppositional Self, a character completely opposite to the player’s personality. The Experimental Self, when a player is experimenting with outlandish or bizarre concepts to see how that would work. The Taboo Self, incorporating themes the player cannot address in real life and often directed at exploring morality. The book as a whole was very interesting and I found it more readable than I expected to. The part I was especially drawn to was the discussion of the types at the end and the different ways in which ways of being can be explored. My observation is that some people engage with this more consciously than others and that I can see that in future I might use these ideas to explore certain themes and concepts. I would have liked more quantitative data, but I appreciate that the studies haven’t necessarily been done. I would also have liked more in-depth consideration of the nine types of character, as I found them disappointingly brief. These things aside, I really enjoyed this and would recommend it for anyone interested in psychology and identity. ← I meet the criteria, why aren’t I famous yet?